Heavy rubber hoses that are cumbersome to handle and lay around on the ground looking unsightly and gathering grime are a thing of the past. Expandable hoses, which are resistant to tangles, kinks, and twists, are revolutionizing the gardening world. They are lightweight, making watering the lawn or flower gardens a pleasure rather than a chore. They are compact when not in use, making for easy storage. And if you get a good one, they work just as well as your traditional rubber hose. When expandable hoses originally hit the market, they were often not very durable and didn’t last long before they started to leak. Many manufacturers now produce sturdier versions, but it’s important to know which are the best expandable hoses and which are going to spring a leak before the season is up. Thinking of buying an expandable hose? Here’s what you should know. The basic advantage of expandable hoses is that they simply make life easier. They do this in several ways: by being lightweight and therefore much easier to maneuver than traditional rubber hoses, as well as being compact when not in use, and therefore easier to store. The disadvantage is that in order to be expandable, they must be made from a less sturdy fabric than rubber, and a result of this is that they can be weak or prone to leaks. Expandable hoses come in various sizes, with the advertised length being the maximum it will expand to. Expansion length will vary depending on water pressure, so if you need a full 50 ft length, it may be sensible to buy the next size up (usually 75 ft) to ensure your hose travels an adequate distance. Different brands of hose will obviously design their hoses differently. You need to look for the sturdiest hose to avoid leakages. A triple layer latex core will generally be more hard wearing than a double layer, and the higher density of the outer layer, the better. Search out a hose with solid brass fittings over plastic, as brass won't corrode or snap. Do You Need an Expandable Hose? An expandable hose is not a necessity for most people, although it will undoubtedly make washing your car or watering your lawn much less of a hassle than using a conventional hose. After all every gardener would love to have a hose that looks nice, not heavy, and easy to store. An expandable host is a clever idea that fits the ideal of what most people want from their hoses. It may be of particular benefit to anyone who struggles with carrying heavy items, or who has limited storage space. It's also worth considering if an expandable hose will be compatible with your property. “Most expandable hoses work best if you have good (high) water pressure. If you have low water pressure, you may not get the hose to extend to its full length” (Which?). There are variations in the instructions that come with different hoses, and it's important to follow these to get the most out of your hose. Some recommend stretching before use, for example. Once you are ready to go, you will simply need to turn on your water source and watch the hose expand before your eyes. Treat your hose with more care than you would a rubber hose to help ensure longevity. Store your hose inside, away from UV light, which can damage it, and don't leave it outside in freezing temperatures. When you look for an expandable hose, compare them to these products. They’re the best available as of the time of writing. The VicTsing expanding hose comes with a 60-day guarantee and a 12-month warranty, compared with the Enerplex expanding hose, which is backed by a two-year warranty and a 100-day money-back guarantee. Elk & Bear offer a lifetime warranty for their expanding hose, promising to replace any hose that fails for any reason, after any length of time, with no questions asked. The expanding hoses from TruTec, TheFitLife, Hosepaip, and 3KM do not come with any manufacturer warranty or guarantee beyond the standard 30 days. All of the hoses claim to expand by three times their size when in use, although some did this better than others according to users of the products. The products particularly affected by this issue are the VicTsing and the 3KM hoses. The TruTec hose, along with TheFitLife hose suffered from poor water pressure, while the Enerplex was noted for its especially good water pressure, making it more versatile than the others. The Hosepaip and VicTsing hoses feature a double latex core, while the rest we reviewed had at least a triple layer core, which will ordinarily result in a more durable and longer-lasting hose. All hoses listed feature corrosion-resistant fittings composed of solid brass in standard sizes to make them compatible with other nozzles and hose connectors. The expandable hoses from TruTec, TheFitLife, Enerplex, Elk & Bear, Hosepaip, and 3KM all come with nozzles to increase functionality. Comparatively, the hoses from Enerplex, Elk & Bear, Hosepaip, and 3KM include a carry bag for storage and convenience. The VicTsing hose did not come with any extras. This 75 ft expandable hose shrinks down to just 24 ft and is backed by an extra long two-year warranty, alongside a 100-day money-back guarantee. The inner multi-layer latex promises to be of the highest quality on the market, resistant to leaks caused by scratches and punctures. Purchase of this hose includes a free carry bag for better storage and transport and a nozzle that can spray ten different patterns. Available in black, green, and blue, this hose won’t tangle, kink, or twist. The heavy brass fittings are rust and corrosion resistant and are supplied in a standard ¾ inch size, making the hose compatible to connect with other standard size hoses and nozzles. Featuring an easy to operate shut-off valve, the flow of water can be easily adjusted. Users love how durable and well-constructed this hose is. An overwhelming amount of users agree that this is the best hose they have ever used, due to its hardwearing and heavy-duty composition. Most expandable hoses, due to the nature of their size adaptability, meaning they must be made from a textile fabric, are not expected to be particularly long-lasting. However, users of this hose believe it is sturdy enough to operate well for many years. Users were pleased with the water pressure of this hose, which vastly improves its functionality. With a good water pressure, it may be useful not only for watering lawns and flowers but also for washing vehicles and hosing down the outside of your property. Users of this product are also impressed with the two-year warranty, which is double the industry standard of one year. Some users who did experience issues with the hose commented that they received excellent customer service from EnerPlex staff members who were both helpful and efficient. This product received very few negative comments from users, though one issue that was reported was that the nozzle seemed to be of poor construction. The original length of this hose is 16 ft, expanding to 50 ft when in use. At 2.3 lbs, it is extremely lightweight and easy to carry around, and it also comes with a spray nozzle and a carry bag. The inner tube is made of 100% natural latex, and the connectors are all solid brass. Due to the compact size and low weight of the hose, it is highly portable and easy to store. The hose is designed to be flexible and tangle and kink free. It is also constructed from durable fabric to prevent any leaks and increase its life expectancy. This product comes with a lifetime replacement warranty, in which the manufacturer will send out a brand new replacement hose if your original fails due to leaks, cracks, or even if it is simply worn out. Elk & Bear promise a hassle-free money-back guarantee and claim that this is the last hose you will ever have to buy. The lifetime warranty is so unusual for an expandable hose that many customers feel it is almost too good to be true! Users are big fans of the lifetime warranty, with many noting it was the reason that they opted to buy this hose over competitors. It’s seen as a sure sign that the manufacturer is confident in its product and doesn’t expect it to run into any issues, which gives the customer more confidence in buying it. Users love how durable the hose is, and the vast majority of users were happy with all aspects of the hose, impressed that it actually performed as well as it claimed to. Some users noted that after sales care from Elk & Bear was excellent, while others commented on how high-quality the fittings and spray nozzle seemed to be. A small minority of users did experience problems with leakage after several months of use, though this should be resolved with a replacement hose due to the lifetime warranty. This 75 ft hose condenses down to 25 ft when empty, and has a triple layered latex core to help prevent leakages and splitting. The fittings are solid brass, which is corrosion resistant, and the hose comes with a stainless steel holder that attaches to the hose fittings with no tools required, for easy storage of the hose. The hose features a shut-off valve, making it compatible for use with a sprinkler. It also features a rubber nozzle with an ergonomic design for added comfort and has eight different spray functions, including mist, cone, shower, and soaker. This black expandable hose weighs 5.05 lbs, making it lightweight and easy to carry around your property. Users of this product love how compact it folds up, and, therefore, it is very useful for camping trips or RV vacations. Some users were disappointed with the water pressure of this hose, noting that the nozzle is so small that not enough water can pass through to create a strong stream of water. Therefore, this hose is mostly recommended for watering flower gardens and lawns, where strong water pressure is not required. The quality of the product was questioned by some users, as the fabric on the outside of the hose snags and frays easily, and many people found that the hose leaked after only a few months of use. The expandable garden hose from TheFitLife is 75 ft when fully expanded. The inner hose is composed of triple layer latex, and the outer is constructed of a woven nylon fabric. The hose is designed to glide easily over any surface, never tangling or twisting to create kinks. The manufacturers of this hose have tested between 1100 and 1200 times under water pressure of 145 PSI/10 Bar. By comparison, they claim that most hoses are only tested around 250 times, proving the durability of their hose compared with competitors. Included in the purchase of this hose is an eight-pattern spray nozzle. The solid brass connectors and fittings are a standard US size and so are compatible with other nozzles. The hose contracts by three times its size when not in use for easy storage. Customers love that it takes up so little space, and can, therefore, be stored very easily over winter. The majority of users of this hose are happy with the quality of the product. They comment that the solid brass fittings seem to be of a high standard, and the hose itself seems sturdy and durable. A minority of customers did complain that holes developed in the hose after a few uses, and some users did experience leakage, though this problem seems to be the exception rather than the rule. Being lightweight, users of this product noted it was easy to transport and required very little effort to use. The nozzle handle is easy to operate, which was appreciated by customers with arthritis. One fairly common complaint was that the water pressure of this hose left something to be desired, and, therefore, would be most useful for lower pressure jobs, such as watering flowers and lawns. The Hospaip hose starts at 17 ft, automatically expanding up to 50 ft when in use. The hose will self-retract when emptied of water for easy tidying up and compact storage. With standard sized ¾ inch connectors in solid brass and a zinc alloy spray nozzle with a rubber coating, this hose claims it will last year after year. The inner tube is made of a double latex structure, and the outer is a toughened polyester fabric. Included with your purchase are an eight-pattern spray nozzle and a convenient carry bag. Users of this hose were generally very pleased with it upon initially using it. Users noted that it was simple to use, functional, easy to store, and had a solid, well-built handle. However, after a few months of use, most users reported problems. One key area of concern was how the inner vinyl tube would come away from the outer fabric after several uses, and the hose would no longer retract to a small size. 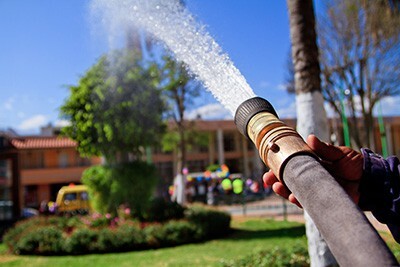 Other users reported that despite every effort to care for the hose it by keeping it indoors, away from direct sunlight or cold temperatures, it would start to leak or unexpectedly explode, rendering it completely unusable. Another problem users experienced was the spray nozzle splitting and cracking after a short time. This 17 ft hose has a maximum expandable length of 50 ft. It is constructed of natural double latex for the inner hose, while the outer cover is 100% woven polyester. Featuring corrosion-resistant brass fittings in a standard ¾ inch size, this hose will be compatible with other hoses and nozzles with standard-sized fittings, so the user can join several hoses together to increase length if necessary. The product comes complete with a handy carry bag as well as a 60-day money-back guarantee and a 12-month warranty. Users of this product love how lightweight it is and the fact that it does not kink. It expands and contracts with ease and is a good size to store. Unfortunately, many users found that although the hose seemed to be durable, it did start leaking after several months of use. Very few users found that the hose lasted any longer than six months. Some users also complained that the hose did not expand as long as it stated, although the expansion will be dependent on water pressure at the user’s property. Other users found defective fittings right out of the box, and even hoses which had seemingly already been used and returned. This hose starts at 17 ft but converts to up to 50 ft when in use. It comes with a nine-pattern spray nozzle, a bag for storage, and a money-back guarantee. The inner hose is constructed of triple layer latex and is covered by a hard-wearing polyester weave. The durable outer layer protects the core and is flexible to ensure the hose does not kink or twist. The fittings are solid brass and are, therefore, corrosion resistant. The nozzle handle is ergonomically designed and soft to the touch, increasing your comfort during use. Users of this product love how durable it is, expressing appreciation for the high-quality fittings and multifunctional nozzle. Many users were impressed that the hose did not leak in spite of being left out in freezing temperatures or dragged over rough ground. One complaint from users of this hose was that it tangles easily when it is contracting in size. Another negative comment from users was that it did not reach the full 50 ft in length when in use. In our opinion, the Enerplex is the best buy in the expanding hose category, with the Elk & Bear expanding hose coming a close second. Users rave about the Enerplex hose even after many uses, which is very telling because expanding hoses commonly experience leaks due to being made of fabric and getting snagged on sharp branches or concrete corners. The Enerplex hose is durable and long-lasting and benefits from responding to even low water pressure, which increases its functionality. It comes with both a nozzle and carry bag, as well as a two-year warranty.